After returning from its winter break to deliver moments of fan service and tease bigger threats, Supergirl again diverges from its season-long arc in order to further explore a member of the team other than the titular superhero. However, the focus on Winn Schott Jr. (Jeremy Jordan) and his relationship with his murderous father Winslow Schott Sr. (guest star Henry Czerny) leaves the other continuing storylines feeling more disconnected than ever. In 'Childish Things', with a story by Yahlin Chang and written by Anna Musky-Goldwyn and James DeWille, Kara (Melissa Benoist) helps Winn track down his father, who has broken out of prison, before FBI agent Cameron Chase (guest star Emma Caulfield) gets to him first. Meanwhile, Alex (Chyler Leigh) convinces Hank Henshaw/J'onn J'onzz (David Harewood) to use his powers as Martian Manhunter in order to find out what Maxwell Lord (Peter Facinelli) is hiding. Plus, James Olsen (Mehcad Brooks) feels conflicted when Cat Grant (Calista Flockhart) offers Lucy Lane (Jenna Dewan-Tatum) a job that would see the couple working on the same floor. Though Winn previously revealed to Kara that his father was in prison, in 'Childish Things' he's forced to confront what Winslow Sr. did to land himself there - he sent a bomb to a toy design competitor that killed six people. Winn is, at first, willing to help Agent Chase track down and recapture his father, but once she makes it clear she will take down Toyman using deadly force, Winn turns to Kara for help. This complicated relationship between Winn and his father gives Jordan a chance to really shine for the first time on Supergirl, giving the role depth beyond the character with unrequited feelings for the lead/the tech wiz. As a result, Jordan is able to elevate Winn's struggle between the man his father taught him to be and the man he wants to be, bringing it to a point that is on par with what we've seen Benoist deliver as Kara throughout season 1. As such, the conversation between Winn and Kara about how they are choosing to forge their own paths separate from Winslow Sr. and Astra (Laura Benanti) is a turning point in their relationship that the episode earns, even as it fumbles through their inevitable kiss. Although the delivery of Winn's unrequited feelings for Kara has been undeveloped and largely cliche throughout the season so far, the show's writers managed to earn the moment in which Winn finally goes for the kiss through the buildup of the scene. It was predictably awkward and led to the necessary confrontation between the two characters - though it comes sooner than expected. Additionally, his subsequent realization of needing to deal with his feelings rather than keep them hidden finally steers this one-sided relationship out of cliche territory. As a consequence of the focus on Winn and Kara's relationship, 'Childish Things' has less time to devote to Toyman. But, Czerny makes good use of his time, playing Winslow Sr. with a hefty amount of earnest sociopathy - especially in the moments when he refers to Winn as his greatest creation. Additionally, his final act, forcing Winn to choose between murdering one man or being the cause of a convention center worth of people dying, gives the episode incredibly high stakes - Winn's innocence - even if 'Childish Things' implemented certain convenient storytelling devices in order to reach that point. However, because of the emotional connection of Toyman to Winn, he comes off as one of the more terrifying one-off villains of Supergirl so far. The most disconnected subplot from the rest of the episode is Lucy's deliberation in accepting Cat's job offer. Her decision is made more difficult when James is also unsure about whether or not he wants to work with his girlfriend - which Cat explains to Kara is the result of him not being able to flirt with her anymore while Lucy is around. At the end of the episode, Lucy takes the position as Cat’s general counsel and James reveals his disquiet has more to do with being unhappy in his own job and wishing he could go back to taking photos. Although this subplot gives viewers a chance to see Cat and Lucy interact - which helps fills a void since 'Childish Things' is noticeably lacking in Cat and Kara's typical mentor conversation. But, on the whole, this storyline serves to remind viewers that there is another side to the love triangle (square?) between the show's young leads while also giving Lucy a reason to be in National City aside from her boyfriend and setting up James's inevitable move back to being a photographer. Still, with so little connection to the everything else going on, it comes off as more of a distraction from the episode's main focus than anything else. Supergirl has aired a handful of episodes since it delivered the big reveal of Hank Henshaw's true nature as J'onn J'onzz a.k.a. Martian Manhunter, but the show hasn't capitalized much on his newly revealed powers - aside from using his shape-shifting ability to put Cat's theory about Supergirl's identity to bed. 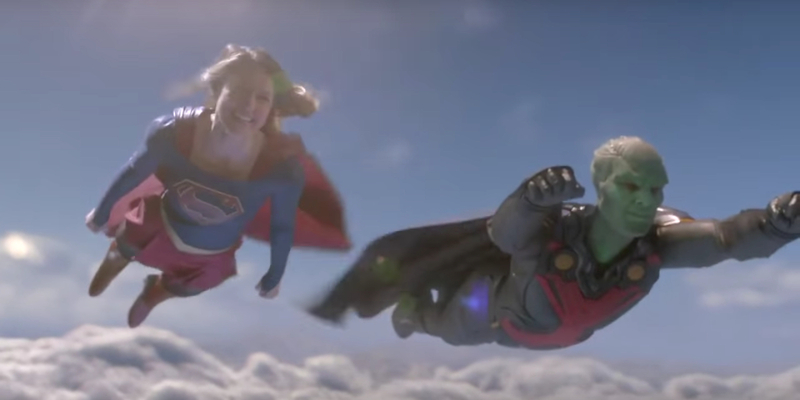 However, now that Kara is in on J'onn's secret, the show takes a moment to revel in the inclusion of both alien characters, featuring a scene of J'onn attempting to teach Kara proper flying techniques. Additionally, 'Childish Things' gives us our first glimpse into J'onn's past on Earth and his struggle with being accepted by the planet's people. In the episode, Alex convinces J'onn to use his powers to further the DEO's investigation into Maxwell Lord by using his shape-shifting to infiltrate Lord Technologies, discovering the girl being kept there. However, when a guard threatens to reveal him, J'onn is forced to do something he swore he'd never do again: wipe the guard's entire memory. Although 'Childish Things' offers our first real look into the character of J'onn, it's largely superficial; the episode teases a complicated past for Martian Manhunter but fails to actually delve into it. In the end, between too much else going on and needing to include so much setup for future episodes, J'onn's part feels more like a teaser than a fully developed subplot. All in all, 'Childish Things' does find joy in each of its plots, entertaining viewers with fun character moments or pulling out the stops for a Supergirl and Martian Manhunter flying sequence. But, like previous episodes this season, Supergirl works too hard to keep up with all of its characters even when the episode may have benefited from a tighter focus or cutting down on subplots.